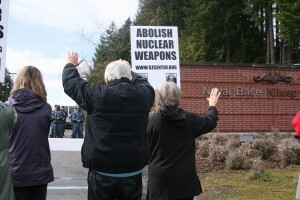 It was a joyful group that gathered today at Ground Zero and processed over to the main gate of Bangor Naval Base. We numbered about fifty, all decked out in rain gear and boots and umbrellas, though by the end of the vigil we had the sun come out to join us. Thomas and Louise read for us from letters sent by sixth graders to Judge Settle. The schoolchildren asked for “a clean, safe, and peaceful future for me and my family,” and for the “miracle” of peace and and a life-giving economy in our country. We prayed for deliverance from and forgiveness for racism, sexism, war, and torture; wastefulness, arrogance, impatience, and silence. We asked that our hearts be converted to compassion, nonviolence, justice, and hope. The sun shone on our procession back from the Bangor Naval Base gate to the Ground Zero Center for Nonviolent Action. People were smiling, talking, kids were skipping, and our banners shone brightly. We went forward united by the drumming and chanting of the Nipponzan Myohoji monks and friends. What did our vigil accomplish? We lived life, felt joy, and shared the warmth of friendship. We shared with each other the sources of our hope. And we did all this in a place where evil is silently assented to every day. For a moment at least, we broke the shell of apathy.